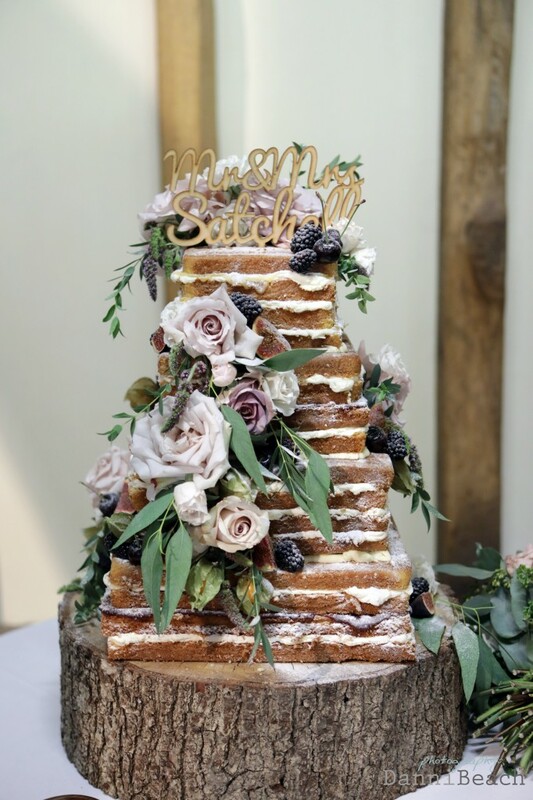 Four tiered naked style wedding cake at Laughton Barns, Ringmer, Lewes, East Sussex. Base tier of Madagascan vanilla bean sponge with whipped Madagascan vanilla bean paste buttercream and Raspberry Conserve. Second tier of fresh lemon zest sponge with whipped lemoncurd buttercream filling, third tier of of Madagascan vanilla bean sponge with whipped Madagascan vanilla bean paste buttercream and Raspberry Conserve. Top tier of fresh lemon zest sponge with whipped lemoncurd buttercream filling. Cake dressed with fresh florals, kindly provided by Pollen4Hire. Image kindly provided by Danni Beach Photography. Cake serves 200 finger portions.